Kristy Biolsi is an Associate Professor of Psychology at St. Francis College in Brooklyn NY, where she also serves as the Director of the BA/MA Program in Applied Psychology. She is a co-editor for the journal Aquatic Mammals, serves on the editorial board for the Journal of the Association for the Study of Ethical Behavior and Evolutionary Biology in Literature (ASEBL), is a co-founder of the Evolutionary Studies Collaborative, and is the co-founder and Director of the Center for the Study of Pinniped Ecology and Cognition (C-SPEC) housed at SFC. She received her B.S. in Psychobiology from Long Island University, Southampton College in 2001 and in 2007 she received her Ph.D. in Cognitive Psychology from the University of California, Santa Cruz (UCSC). 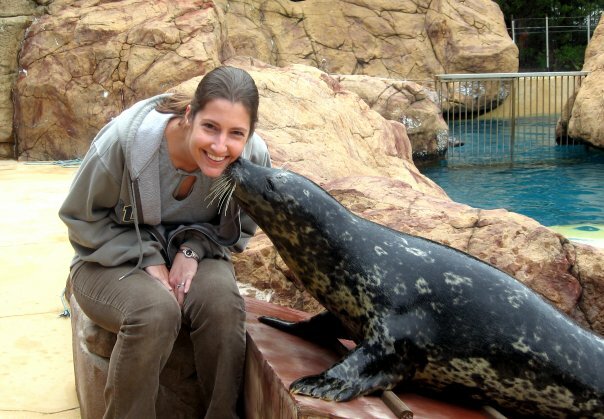 Her research focus was on marine mammal cognition and while at Long Marine Lab, UCSC, she worked specifically with the Pinniped Cognition and Sensory Systems Lab. Her current research interests are in comparative cognition, focusing on marine mammals, and she has two main lines of scientific inquiry; laboratory work that is conducted at the Long Island Aquarium and Exhibition Center in Riverhead NY investigating discrimination learning and categorization with two captive, trained, California sea lions and field work which consists of data collection from surveys and naturalisticobservations of the local wild harbor seal population. We even touched on some theoretical stuff about animal morality.